Thinking about having double glazing fitted? Take a look at our range of doors and windows. The P&M Windows team never hesitate when recommending double glazing to clients – because our experience tells us that their homes will be warmer, and their heating bills will be smaller as a result of installing them. Our double-glazed windows and doors reduce energy loss from your home, provide superior weather resistance and add an important extra layer of security to your home. What Are The Advantages of Double Glazing in Bedford? An insulating layer of air between two panes of glass which keeps the warm air in. Noise reduction – better insulation keeps street noises out. Enhancement of your home security – double-glazed windows are difficult to break. uPVC (unplasticized polyvinyl chloride) is a low conductor of heat, making it the ideal frame for keeping warm air in, and the cold weather out. The British Fenestration Rating Council (BFRC) has rated uPVC windows as being ten times more efficient than any other framing material. uPVC frames are also easy to keep clean, have a lifespan of around 35 years, and are completely recyclable. 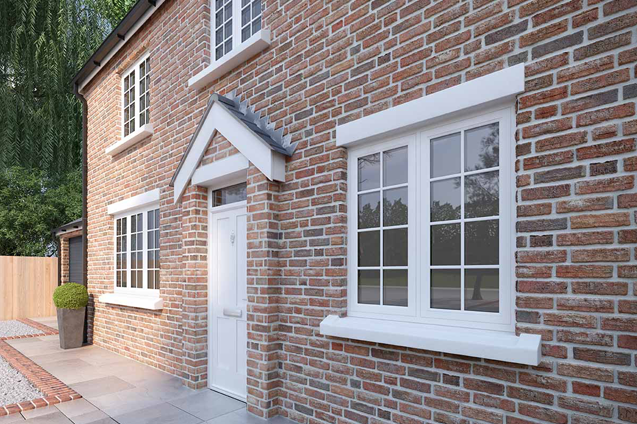 Whilst aluminium frames may have got a bad press back in the 1970s, the new generation of double-glazed black or charcoal frames are an extremely popular choice for contemporary builds. The innate strength and stability of the aluminium means that frames can be ultra-slim making the glass, rather than the frame, the dominant feature. Aluminium doors and windows don’t expand or contract in response to temperature changes, they’re extremely durable, and they increase the light entering your home. Why Choose P&M Windows For Your Double Glazing Bedford? P&M Windows is a local double glazing company in Bedford with 15 years of experience in providing the very very best quality for our customers. We’re FENSA registered, which guarantees our customers excellent service and products, and all the windows and doors we install are sourced in the UK and highly rated for energy efficiency, security, and quality. We’re a family run business with over 90% of our business coming from recommendations. We don’t subject our customers across Bedford to a ‘hard sell’, because we know that’s not what they want. Instead, we supply a free no obligation written quote, outlining the full specification and pricing. Alternately, we offer instant quotes online via our website. Our friendly installation team is always happy to talk you through the quote and answer any questions you may have. If you’ve been thinking about having double glazing fitted, or you have windows that need replacing, call us today on 01582 585417 for advice or a free no obligation quote.